Wine Review: 2007 Bogle Phantom | Wine Splash! 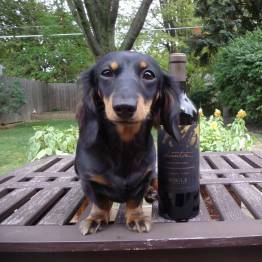 WineDox Daisy give the Phantom 4 out of 4 Paws! We have been saving this wine for a cool, blustery, autumn night like tonight. The sun has been setting in the late afternoon and the smell of fallen leaves is in the air. And with Halloween only 10 days away, we felt it was time to release the Phantom! This mystical presence is a blend of Petite Sirah, Old Vine Red Zinfandel, and Old Vine Mourvedre. A whimsical, playful wine that is deep, dark, fun, and zesty! No ‘tricks’ here since this wine was a real ‘treat’. On sight, the Phantom had a reflection that was deep, dark, and garnet in color. In our glass, magical aromas of dark berry, black currant, cedar, and spices cast a spell on my sense of smell. On the palate, the Phantom was full bodied, rich, and eerily velvety. Enchanting flavors of fresh blueberry, ripe blackberry, cedar, and vanilla spice. Hints of cinnamon and earth led into a lush, eternal finish that made you thirst for more! The Phantom was more than good, it was Supernatural! We would pair this hauntingly tasty wine with most hearty dishes, red meats, barbequed foods, and medium to strong cheeses. We really loved the Bogle Phantom and hope another 2007 vintage will materialize for us. But we feel that tasting a newer vintage will also be just as magical. We give this 2007 Bogle Phantom a 90 point rating which we feel is well deserved. Lots of lush dark fruits, exotic spices, and a long, full finish. If you have a 2007 vintage, we would drink this wine before 2014 to experience the best flavors. For you thrill seeking red wine lovers, we might also suggest that you go to your favorite cemetery at the next full moon and open your bottle at midnight to discover what the Phantom has in store for you! Aahhh…HaHaHaHaaaaaa!